Green Butte Ridge, Mt. Shasta, CA, 9300 feet elevation (2835 m). 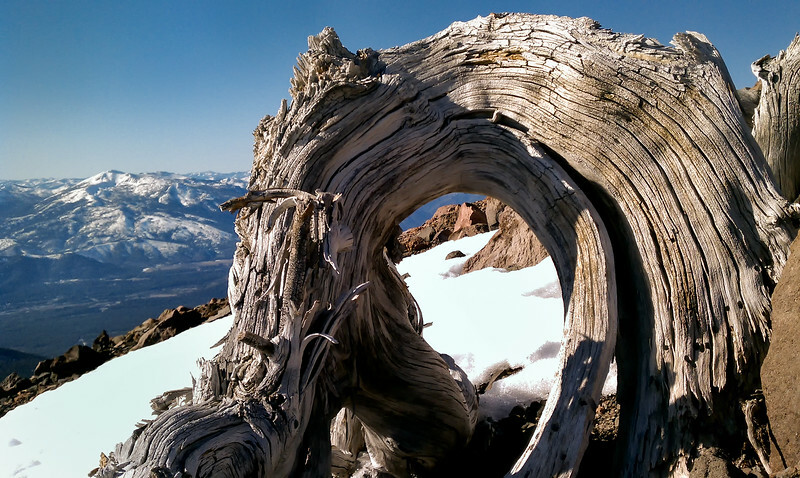 At the very highest edge of the tree line, this gnarled old Whitebark pine resembled a human skeleton, pitched forward in death. At this elevation, these pines rarely get more than 4 feet (1.5 m) tall, and they are often twisted into odd shapes due to wind and snow. Natural alpine bonsai, these stunted trees can live to be hundreds of years old, and invoke a spirit of strength, and perseverance.